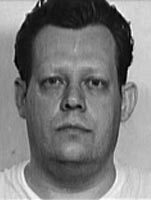 Halloween lovers can thank Ronald Clark O’Bryan, executed just after midnight on this date in 1984,* for a major buzzkill. O’Bryan spiked his own kids’ Halloween Pixy Stix with cyanide in an effort to kill off the urchins and collect the insurance. His 8-year-old son died. Although O’Bryan was after his own kids, he might have given some out to the neighbors as well. Some nutbar kills his offspring for the insurance money back in the Ford administration, and that’s why you’re still getting crayons in your pillowcase sack. Crayons. Siouxsie and the Banshees turned this creeper scenario to good effect in the 1986 song “Candyman”. To strike in cloak and dagger, see! Apparently you can lay a Rice Krispies treat at his grave in Forest Park East Cemetery. * There are some reports out there of a March 30 execution, but newspaper accounts do appear to confirm that O’Bryan was put to death in the early moments of March 31, a Saturday. ** O’Bryan’s prosecuting attorney also still hates Halloween. Ford WAS president in 1974, which was when Ronald Clark O’Bryan committed the murder that lead to his execution in 1984. I’m fairly certain Ford wasn’t President in 1984. Plus, you CAN eat crayons. Though I hear they don’t taste so good. “Some nutbar kills for the insurance money in the Ford administration, and you’re still getting crayons in your pillowcase sack. Headsman, is this your verbiage or is it from someone else? I never cease to be intrigued at the language here, it ranges from sublime to outrageous, inspirational to absurd, I have cried several times both from joy and from outrage.